Hi, my name is Anthony, and I am the full time team member here at Music and Arts! 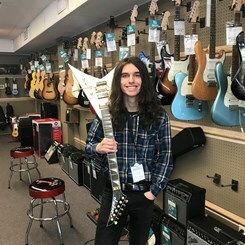 As a former lesson student and aspiring guitar player, I love being around music and the people who share it, which makes me excited to share it with you! I was born and raised in the Seattle area and have lived here my whole life, what a city for music right? I am the rhythm guitar player, lyricist, and vocalist for a local metal band that I recently formed. I am all about expression no matter where it comes from! Music has had a tremendous impact on my life and the opportunity it gives us all is truly inspiring and something I am grateful for.